BBC coverage: Live text commentaries on the website from 1600 BST each day, regular updates on 5 live, full commentary on 5 live sports extra in week two, both finals on 5 live. Live on Sky Sports and Eurosport. Reigning champion Roger Federer booked a US Open quarter-final clash against Robin Soderling with a 7-5 6-2 6-2 win over Spaniard Tommy Robredo. The world number one broke Robredo in the 11th game to clinch a tight first set before breaking twice more in a far more comfortable second. An aggressive Federer wrapped up victory in the third set with an ace. Novak Djokovic remains on course for a semi-final against Federer after beating Radek Stepanek 6-1 6-3 6-3. Djokovic, seeded fourth, had a surprisingly easy time in the final night-session match as he eased past the 16th seed in one hour and 46 minutes on Arthur Ashe Stadium to set up a quarter-final against Fernando Verdasco. Soderling became the first man into the quarters when Nikolay Davydenko retired in the third set of their match. The Swede, who lost to Federer in the French Open final, was 7-5 3-6 6-2 ahead when the Russian quit. "He's got a big game and we had the final of the French Open - one of the most important matches of my career - so it's nice to play him again," Federer said of his forthcoming clash. "He has got some great shots and is strong off the baseline." Federer beat Soderling with ease at Roland Garros and will be expected to perform another demolition job on the 12th seed, following a straightforward win over Robredo. The Swiss superstar played in third gear for much of the first set but then began to dictate the play in the second, breaking in the third game and then securing another break to move to 4-1 up before serving out for a two-set cushion. Federer then began coming to the net with more frequency as he became more comfortable. Robredo looked more and more ragged and was broken in the opening game of the third set, and again in the third. The Spaniard held serve for 4-1 but it only delayed the inevitable. "I tried to figure him out a little bit, the way he played me," Federer said of a cautious first set. "I thought he really played my backhand a lot. "I expected him to open it up sometimes towards my forehand but he didn't. I was a little unsure there for a while, how I should play him. He was doing a good job of keeping me off balance and being intense from the baseline. "Once I got the lead I could also hit a bit more freely. That didn't allow him to play his game any more. 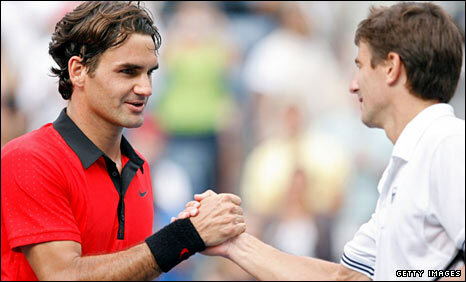 I got on top of him and played good tennis." Soderling was in confident mood ahead of the rematch, saying: "I have improved my game in every aspect and I just need to do it in majors. "I have been beating good players and that has boosted my confidence. I think I have a chance to do well on hard courts." A disappointed Davydenko, who was seeded eighth, seemed unsure as to what caused his pain. "Just some muscle problem, like groin muscle maybe," he said. "In the middle of second set I felt something painful in the muscle, and every point I have more and more pain. "I called physio as I was thinking, 'What is wrong?' I really don't know if it was a big injury or small injury. And physios also cannot tell me anything. I need some MRI scan to check my muscle." Spanish 10th seed Verdasco beat John Isner 4-6 6-4 6-4 6-4, leaving no American men in the last eight for the first time since the Open era began in 1968. "We got a lot of people to the round of 32 then I played Andy (Roddick) and one of us moved on," said Isner. "But after that we didn't do too well. But we had tough draws. "I wanted to go further, but I just got outplayed today. It was a good tournament and I can build on this for the rest of the year."